Herbaceous perennial, usually treated as an annual. 20cm height by 40cm spread. 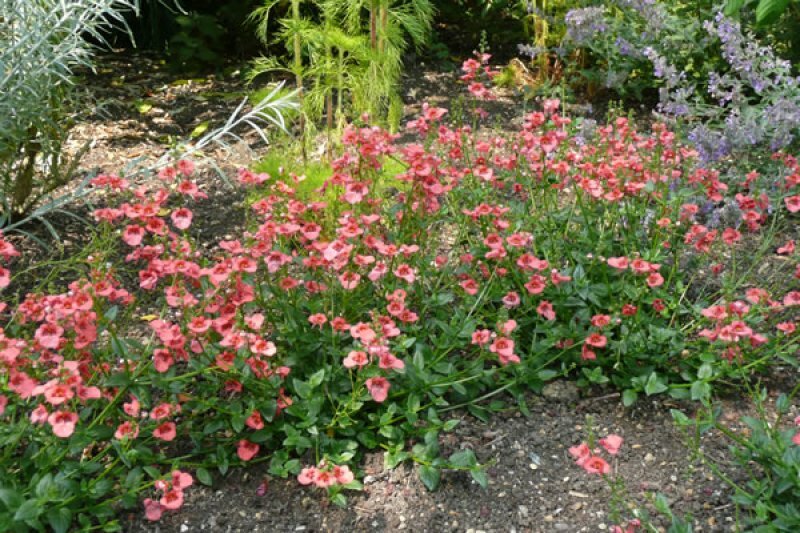 Fast, will reach full height in a couple of years if grown as a perennial. 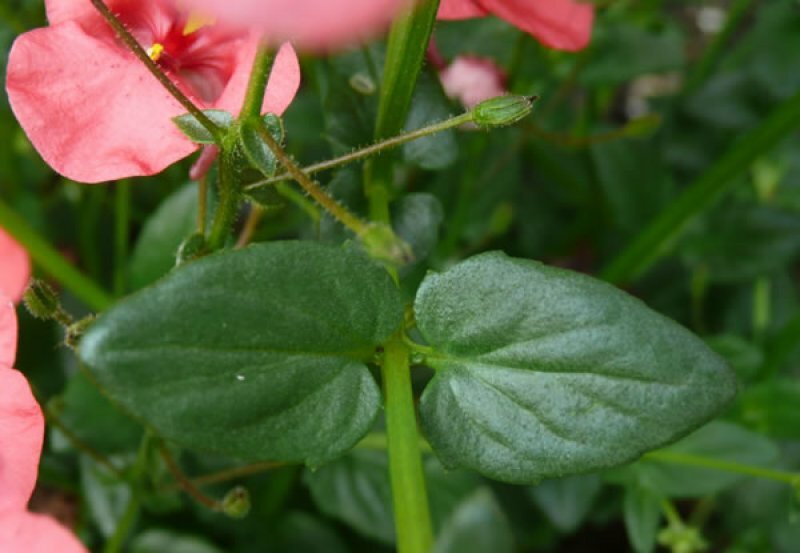 Slightly straggly, spreading mat of stems growing upright and bearing leaves and flowers. Flowers throughout summer and autumn. Five petalled, salmon pink flowers with yellow throats and two ’spurs’ on the reverse. Dark green, heart shaped, opposite leaves provide a good foil for the flowers. Generally used as an annual in summer bedding or container displays. Can also be used on slopes or in borders. Could be used in cottage style, informal or Mediterranean style gardens. While strictly speaking this plant is a perennial, it is unlikely to survive the winter in the UK and is generally treated as an annual. If you want to keep it from year to year you’re better off growing it in a container so it can be moved under cover in the winter. Water regularly in dry periods. If you intend to keep it as a perennial, protect it from frosts, for example by overwintering it in a greenhouse. Deadhead regularly or trim lightly after the main flush of flowers to keep it neat and encourage further flowering. Take softwood stem-tip cuttings in spring, or in the summer from the re-growth resulting from trimming or deadheading the plant. Protect the cuttings from frost over winter. Seeds will only be produced by the plant if more than one cultivar or species is grown and are unlikely to come true to type. This does give a good opportunity to have a go at deliberate hybridisation to come up with new variations. Sow seeds at 15˚C, they should flower in the same year. Slugs and snails can be a problem. Received the Royal Horticultural Society ‘Award of Garden Merit‘. 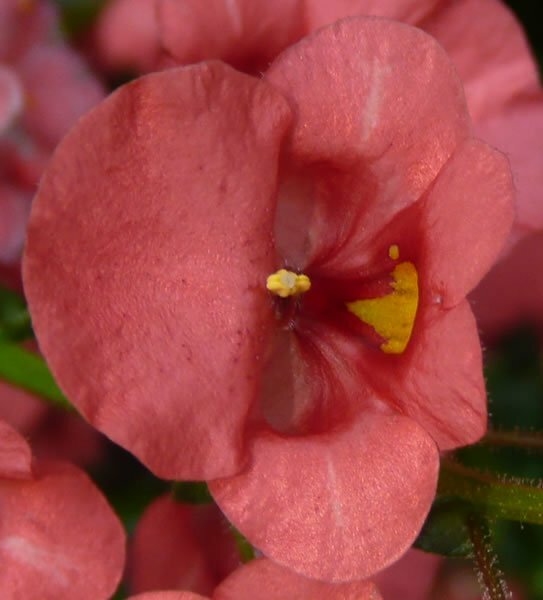 The plant has the common name ‘twinspur’ due to the two spurs which stick out of the back of the flower, and distinguish it from similar flowers such as Nemesia.